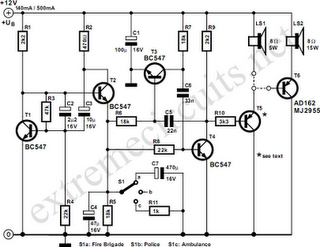 The circuit described here can create three different ‘US-style’ siren sounds: police, ambulance and fire engine. The desired sound can be selected using switch S1. 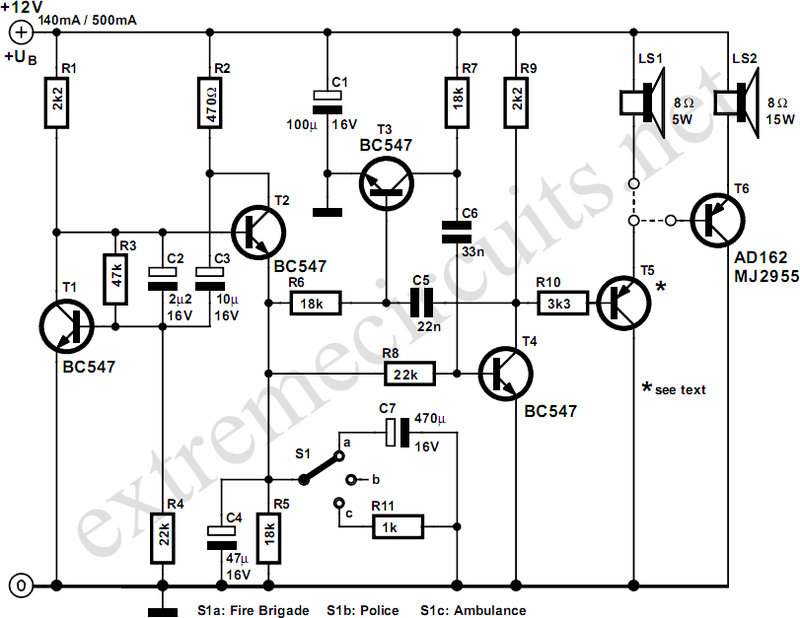 The circuit can be used in toys (such as model vehicles), as part of an alarm system, and in many other applications. For use in a toy, a BC337 is an adequate device for driver T5, since it is capable of directly driving a 200mW (8Ω) loudspeaker. In this case the current consumption from a 9 V power supply is around 140 mA. If a louder sound is required, a BD136 is recommended: this can drive a 5W (8Ω) loudspeaker. The current consumption from a 12 V supply will then be about 180mA. If still more volume is desired, then T5 (a BD136) can be used as a first driver stage, and a 15W (8Ω) loudspeaker can be connected via output transistor T6. Here an AD162 or an MJ2955 can be used, which, for continuous operation, must be provided with cooling. The peak current consumption of the circuit will now be about 500mA with a 12V power supply. Capacitor C1 is not required for battery operation.